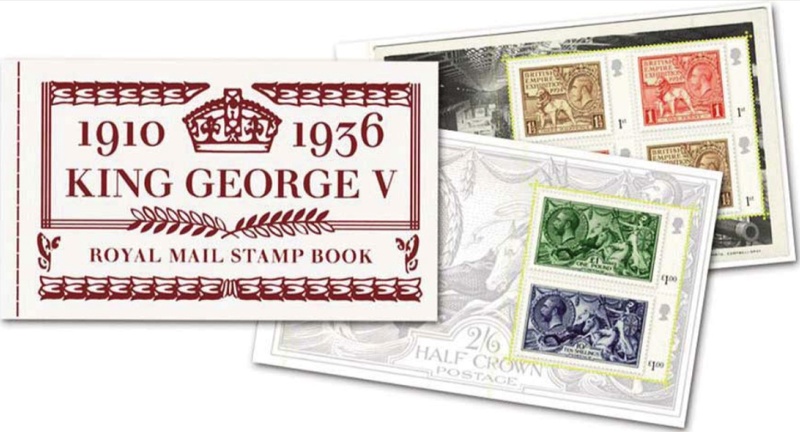 Royal Mail has made a significant investment in this year's international exhibition, and seems determined to recoup as much as possible from visitors and other collectors. Prices shown here are face value or Royal Mail retail prices. I posted some of this information in February with the pictures we had then, but more (I daren't say 'complete') details are now available, so this is an illustrated summary. 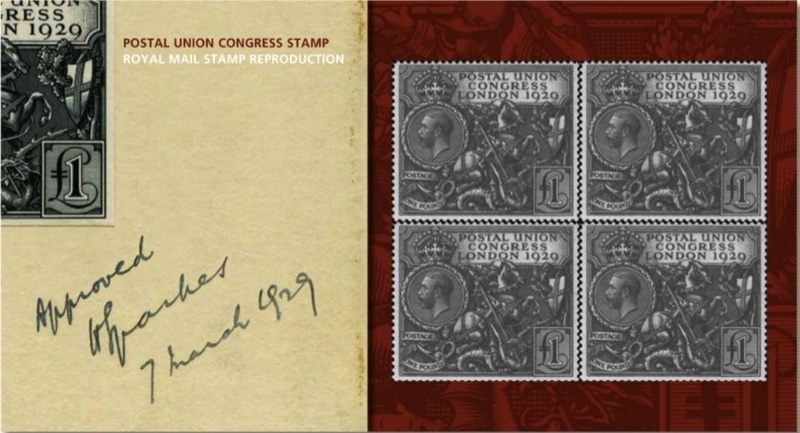 6 May Miniature sheet (£1.41) with two stamps, the 1st class shown above and a £1 brown showing both Downey and Mackennal George V heads. Royal Mail standing order customers will apparently only get a First Day Cover of the miniature sheet, and not of the single stamps. 6 May George V British Rarities ingot cover and Commonwealth Rarities ingot cover, priced at £32.95 each. 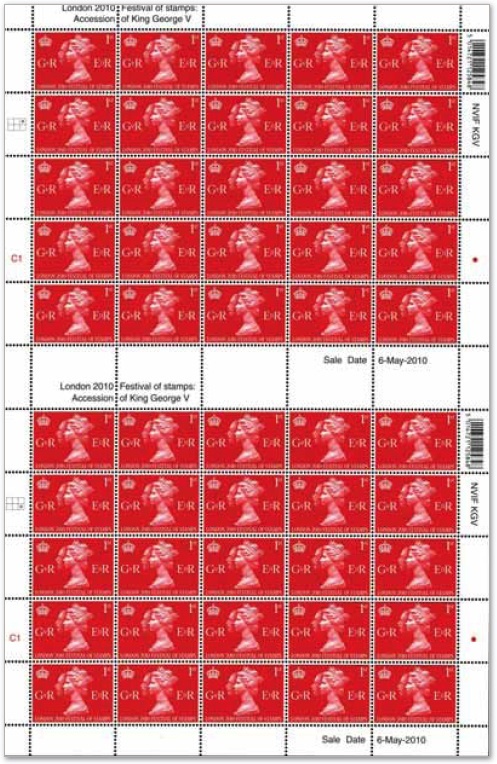 8 May Miniature sheet (£2.82) with four stamps. 2 x 1st class showing the two 1924 British Empire Exhibition (BEE) stamps, and 2 x £1 showing the 10/- blue and £1 green Seahorse definitives. 8 May Prestige Stamp Book with 4 panes of stamps. Pane 1 has 3 each of the 6 May stamps arranged checker-board fashion (£4.23); Pane 2 has the two seahorse stamps (£2.00); Pane 3 has four BEE stamps arranged checker-board fashion (£1.64); and Pane 4 has self-adhesive (for the first time) Machin 2nd class (2), 1st class (4) and 50p (2) definitives with security features (£3.28) (Total £11.15!). 8 May Prestige Stamp Book first day cover set. Royal Mail will produce a set of 4 FDCs for all the panes in the book. This may be a first. 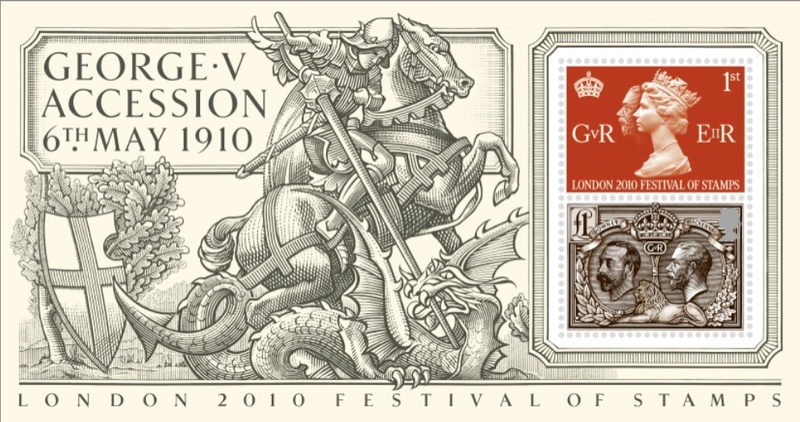 In 2000 Royal Mail produced three FDCs for the Profile on Print PSB panes containing oversized stamps (these were new stamps not previously available elsewhere). 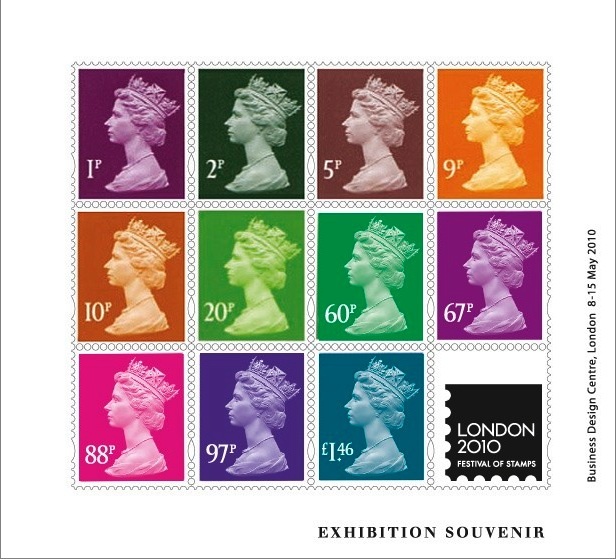 I have a recollection, however, that Royal Mail also produced FDCs for either the very first PSB - the 1969 Stamps for Cooks book - or the £1 Wedgwood PSB issued in 1972. EDIT: This sheet will not be sent to Royal Mail's regular customers as part of their Standing Order, but must be bought at the show or ordered separately from Tallents House - stock code S1003. 8 May Exhibition Overprint Sheet: 6 May sheet overprinted (or maybe the legend is incorporated into the printing?) BUSINESS DESIGN CENTRE, LONDON 8 - 15 MAY 2010 in the top right corner. EDIT: This sheet will not be sent to Royal Mail's regular customers as part of their Standing Order, but must be bought at the show or ordered separately from Tallents House. Update: Two sources, a collector in the UK and a dealer in Australia, told us that they had been told by Royal Mail that this sheet would be available after the show, from the Bureau at Tallents House - we are now advised that this is not so. 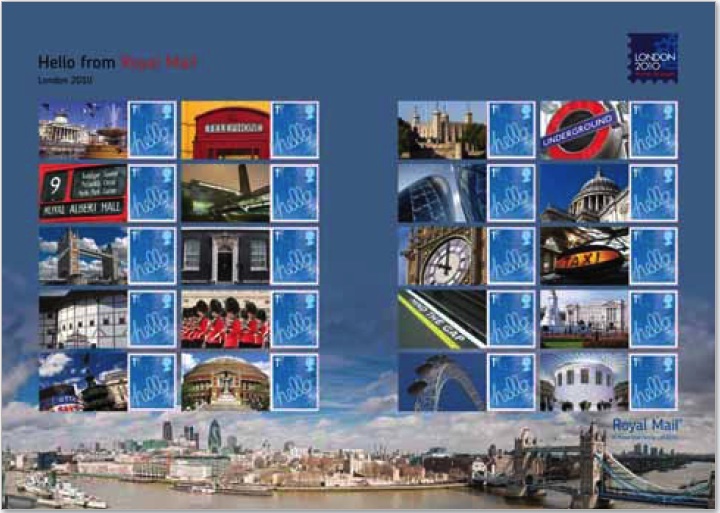 Royal Mail also told dealers, before the show, that this sheet will be in the Year Book, due in November. It remains to be seen whether this information turns out to be true. 8 May Collectors Pack containing most of the current Machin definitives. 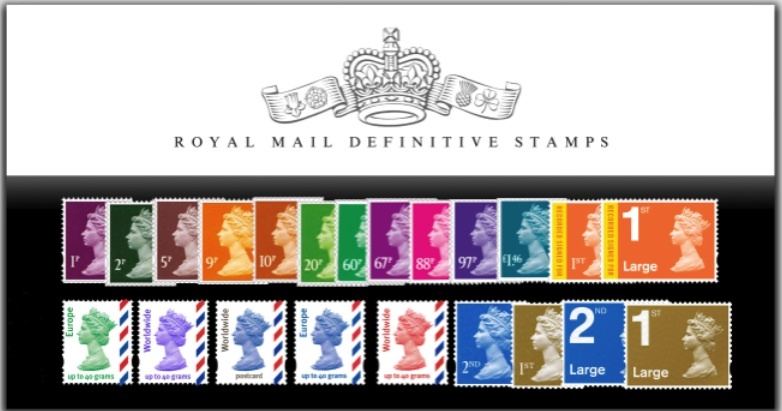 The low-value collectors pack will contain all the definitive stamps still on sale at post offices (as listed above) plus the self-adhesive 20 gramme, 40 gramme and postcard airmail stamps, the 2nd*, 1st*, 2nd Large* and 1st Large* NVIs, and the 1st and 1st Large Recorded Signed For stamps. Not shown in the publicity picture, but included in the pack, will be the 50p* & £1*. *Self-adhesive security definitives (£16.10). 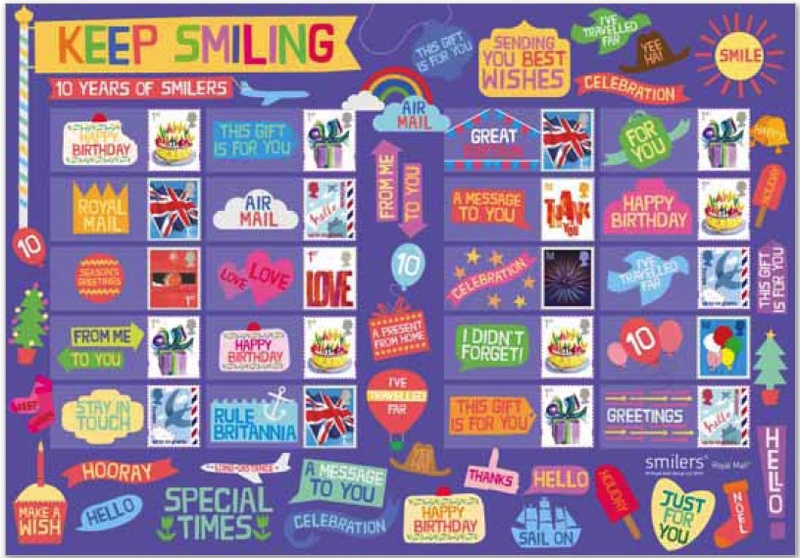 8 May 10th Anniversary of Smilers® Generic Sheet, containing an assortment of stamps available in the Smilers service, including the new 1st class Birthday cake (x4) and Present (x4) stamps, 20gr Europe (x2) and 20gr Worldwide (x2) stamps, and the 1st class Union Flag (x3), Balloons, Firework, Thank You, Love, and Robin. This will also be available for personalisation at the London 2010 exhibition, and these sheets will be overprinted with the Exhibition Logo (£10.00). 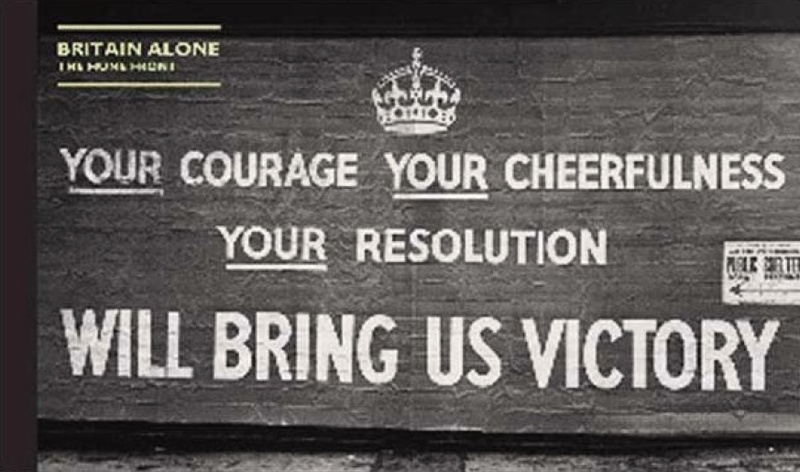 13 May Britain Alone. 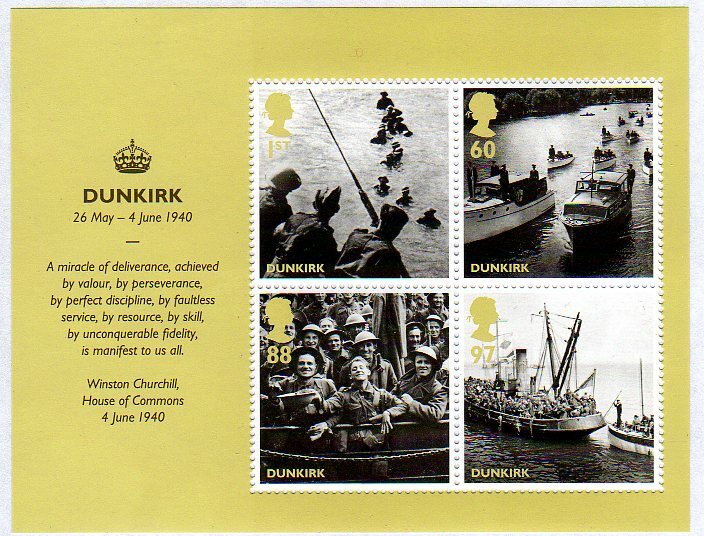 Set of 8 stamps and Miniature Sheet of 4 stamps, the latter marking The Dunkirk Evacuation. (£5.30 and £2.86). 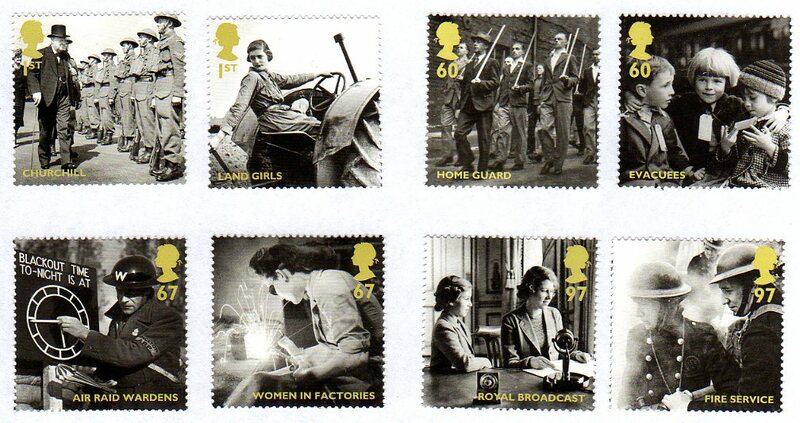 Also a set of 13 Stamp Cards (one for each stamp and one for the MS - 35.20), a presentation pack (£8.70), and a Prestige Stamp Book (£9.76) containing the 8 stamps from the set and 4 from the miniature sheet on 3 panes, plus a pane of Machin definitives 4 x 5p, 2 x 10p, 2 x 60p. There will also be a Dunkirk Medal Cover at £14.95. Keen observers will note that the 1st & 2nd class Large Letter booklets with source code MA10 should also be added to this list, having been found in Royal Mail's stock on 8 May. Cheers for all this info. You do a better job of marketing the stuff than RM themselves do! dizzy from downunder :-) ...dizzy about the selection, dizzy at the cost it will , dizzy just thinking about it all and your amazing patience Ian..
Great piece...well done Michael cddstamps. For completeness I have added to the 13 May entry the Security-featured 1st & 2nd class coils, which is also the subject of a separate blog entry. Was the Jeffrey Matthews Exhibition Souvenir sheet available at local POs? I was incorrectly charged £5.05 for one of the other MS issued which suggests that it might have been available. The Machin souvenir sheet should have been available at POs (although I don't think it was disributed on standing order from the Bureau). A letter in this month's Stamp Magazine indicates that there was considerable confusion in POs and that your experience was not unusual. Did you get your overpayment back? If not you should certainly do so, though it may be difficult for your postmaster to give it to you. Well, some people like them. There is a limit to how many you can sensibly keep. Either they stay rolled in tubes, or you frame them. How many walls do you have? :-D I certainly don't have room to store them either way. 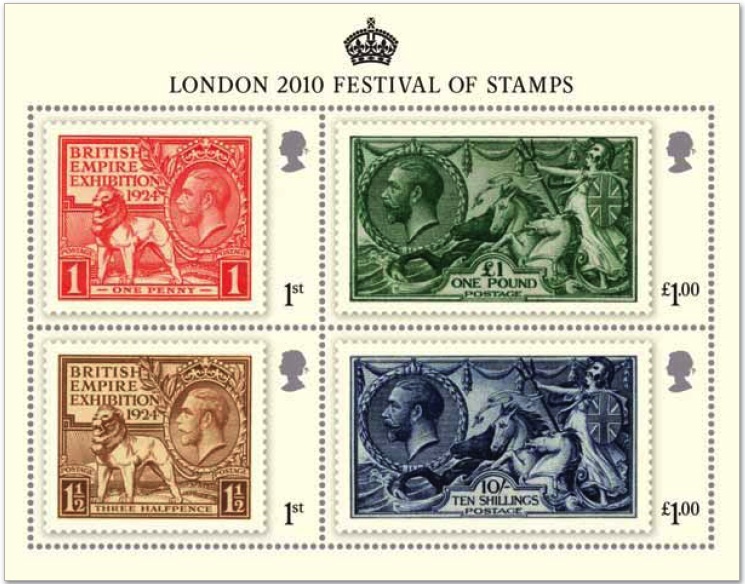 The smallest ones are quite attractive, and of course at least 1 of those issued for the 2010 Festival had alternate columns inverted which was a novelty. If people want to spend the money, then RM would be foolish not to continue to produce them considering the production cost is so low. The cost of careful packing and posting is probably higher.